This week I've been slacking, slacking with a capital SLACKING. 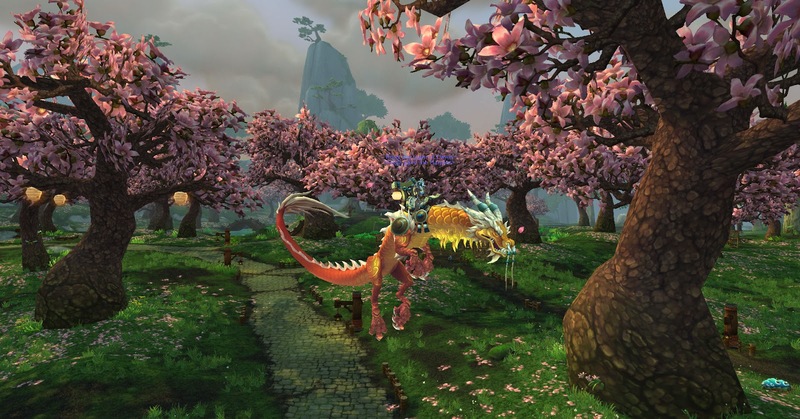 Wait, scratch that I've been slacking since Mists of Pandaria was released this week has been no real exception. I'm usually pretty reputation focused but so far I've been neglecting my daily's most days! I got Tillers to Exalted pretty quickly on my main, deciding to work mostly on one faction at a time. I'm slowly working my way though Golden Lotus, Shadow-Pan and August Celestials but only every couple of days. My Paladin and Hunter are both Revered with Tillers and my Hunter is slowly gaining Golden Lotus reputation for Leather working patterns. During Pilgrim's Bounty if you eat five of each food at the bountiful table outside the capital cities you get a buff called Spirit of Sharing. With this added incentive I decided to finish off my Order of the Cloud Serpent grind. I hadn't been farming eggs or doing the profession quests because I'm super lazy and I hate archeology with a passion but I knuckled down and did all of my quests after handing them in..
You can't actually be serious? Are you serious? You are aren't you? So with that wonderful experience behind me I went out egg hunting. Until this point I hadn't bothered looking for the Onyx Eggs but I came across a few and handed them in and finally got my Cloud Serpent! I'm a little sad that you can't ride them on other characters as I bought the other two colours and was hoping to use a different one on my Hunter and Paladin. Oh well, Korla worked for them so I guess it's only fair that she's the only one that gets to use them! Gratz hon :) I had almost exactly the same rep problem - except I just had to go to sleep so I went egg hunting 1st thing in the morning!